We didn’t know what airline Mike and Charlotte would be on into Nassau so we didn’t really know if they would be on time. It was great to see Mike’s white hair as we peered through the custom’s doors. They had come on a red-eye but we had plans for them so there was no time for sleep. 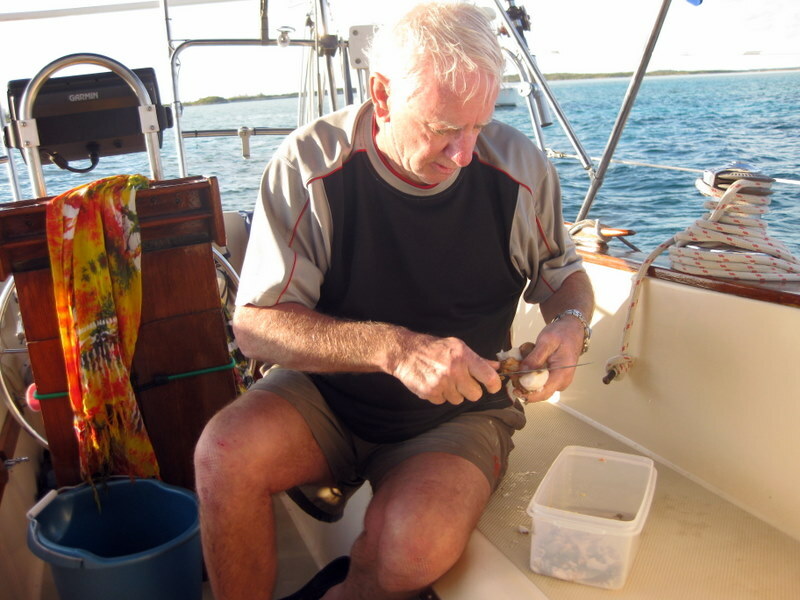 We took them back to the boat – had conch salad we had made that morning and washed it down with beer. After a quick tour we walked over to Potter’s Cay under the bridge to Paradise Island. 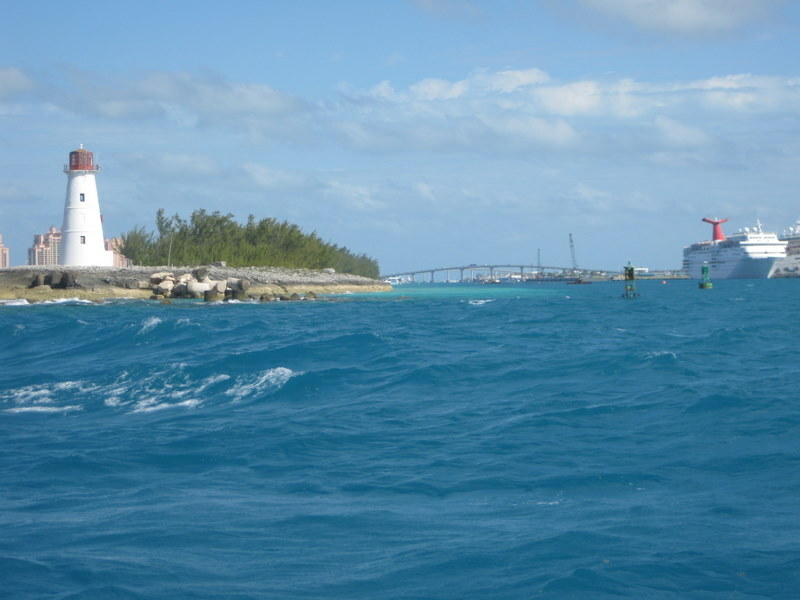 Potter’s Cay is where the mailboats gather supplies to take to the Out Islands of the Bahamas. 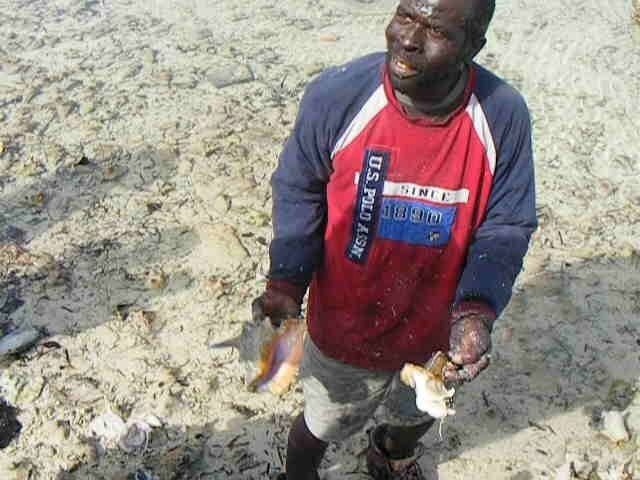 Local fishermen sell conch and freshly caught grouper, barracuda, market fish and others. We bought conch fritters and Kaliks and watched the hustle and bustle of the market. Mike bought 5 pounds of market fish and we took it back to the boat for dinner – along with a small lobster tail. We had boullabaise and drinks and finally let Mike and Charlotte go to sleep. Next day after fueling up we set out for Allan’s Cay. 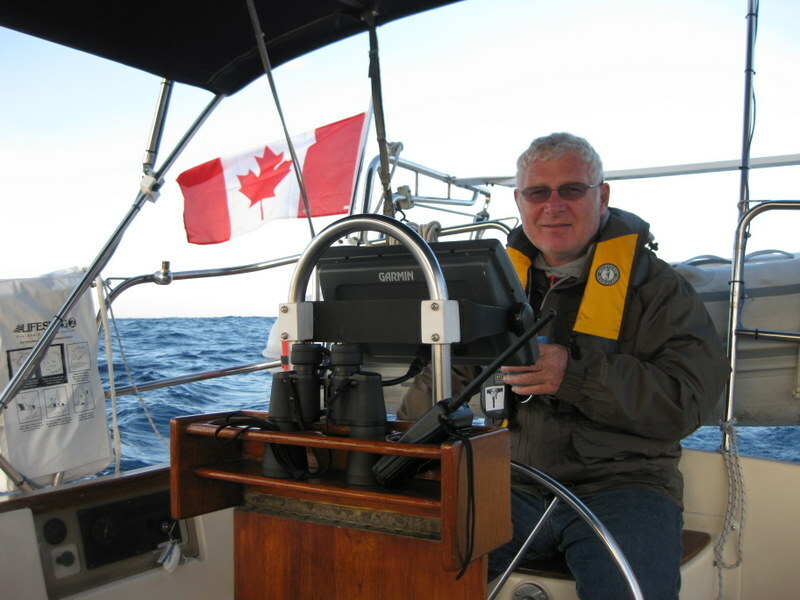 We had some good sailing but the forecast for light winds came true and we motor sailed for a couple of hours. 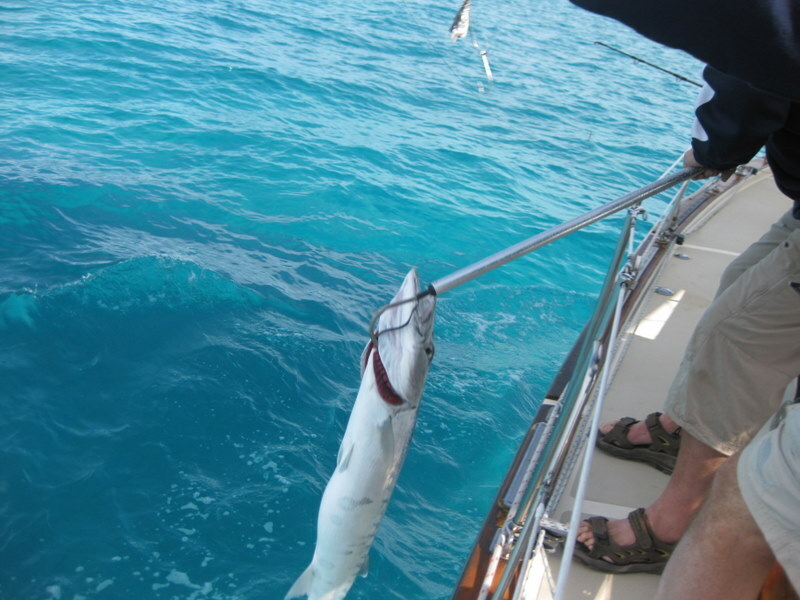 We had to stop the boat once for Mike to pull in a 42 inch barracuda. I don't think this is seaweed! We had been warned about the poisons that collect in large barracuda so we reluctantly let it go. We had to curl Mike’s fingers off the line! 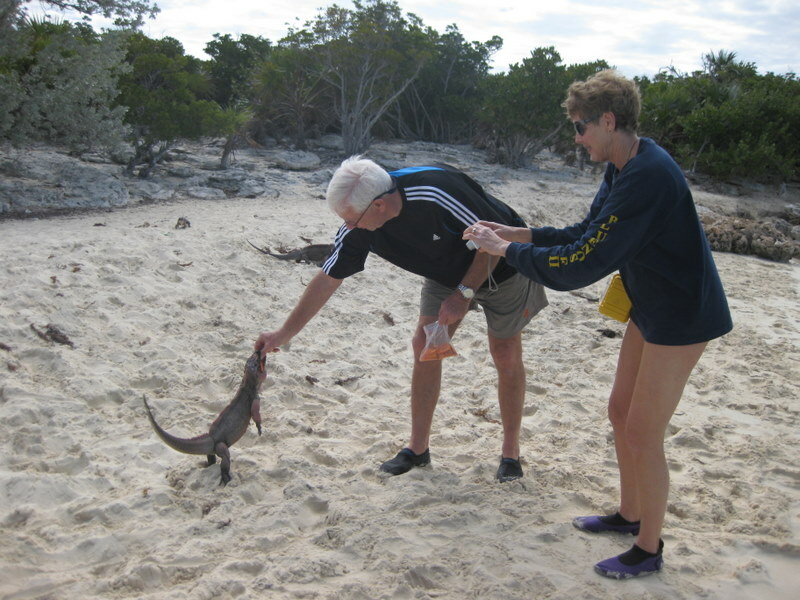 We had been to Allan’s Cay 32 years ago so our memory was a little foggy. We arrived in the late afternoon and the big iguanas couldn’t be bothered with us so we went back to the boat for a swim, cracked conch dinner and a great sleep. After breakfast the next morning we had a swim but Glen and Mike had to be rescued by Pat and Wayne from Kolibrie as the current was strong. Charlotte’s strong swim strokes enabled her to return to the boat by herself. We went to shore and saw the big boy iguanas. At one point, Glen counted 25 and we are sure there were even more later on. Mike fed them carrots and insisted that they didn’t have teeth until one took a piece of his finger. Charlotte tried to teach them tricks with a grape stuck on the end of a stick and succeeded in teaching one of them to roll over. 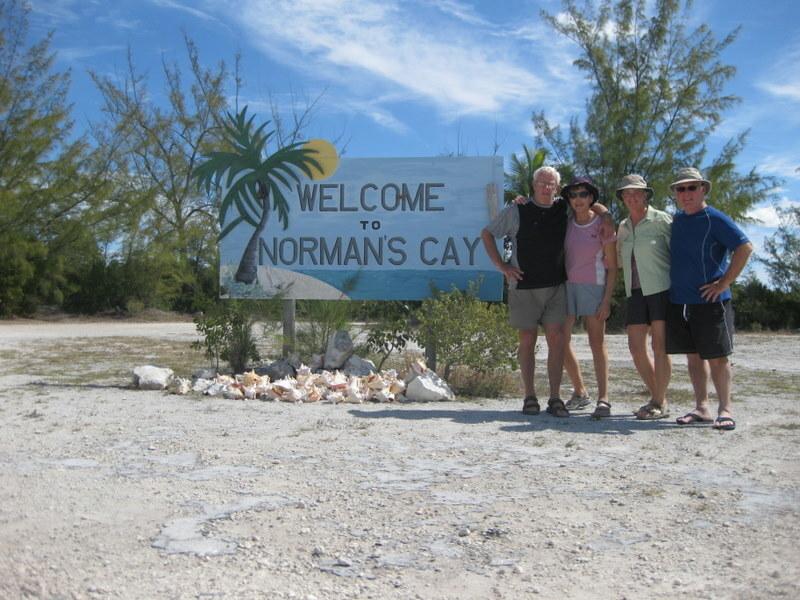 After another great swim, we motored 15 miles to Norman’s Cay. Charlotte cut them up for conch salad and beat the crap out of others for cracked conch. Pam mostly criticized. A fair bit of clean up was required to finish the process. Glen just jumped in the water to get all of the shell and conch meat bits off. Met the neighbours, Kevin, Deena and Connor from Kelowna who are out on their catamaran, Sabbaticus, for a couple of years. Left for Warderick Cay in the Exuma Land and Sea Park in the morning. Not a nice sailing day… but doable and fun on other fronts. 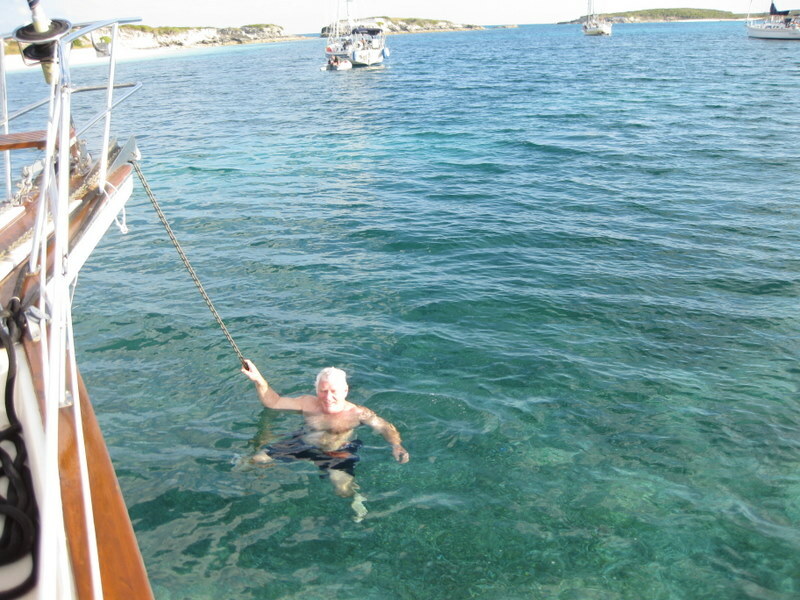 Tucked into Hog Cay on a mooring for a secure night. A walk in the morning to the Pirate's Lair and Alive Beach. We then moved the boat up to the north anchorage which is favourable. We met Pat and Wayne from Kolibrie and Mary and Axel from Azaya when we were checking in. Nice to see them and hear of their adventures. We did another walk from the north anchorage and saw BooBoo Hill and the Blow Hole. The water is so crystal clear that we watched fish under the boat as we watched a beautiful sunset. Inmans are looking at booking early for next year. We have made reservations for them to leave from Staniel Cay (about $100 each) to return to Nassau to head on to Orlando and then home. 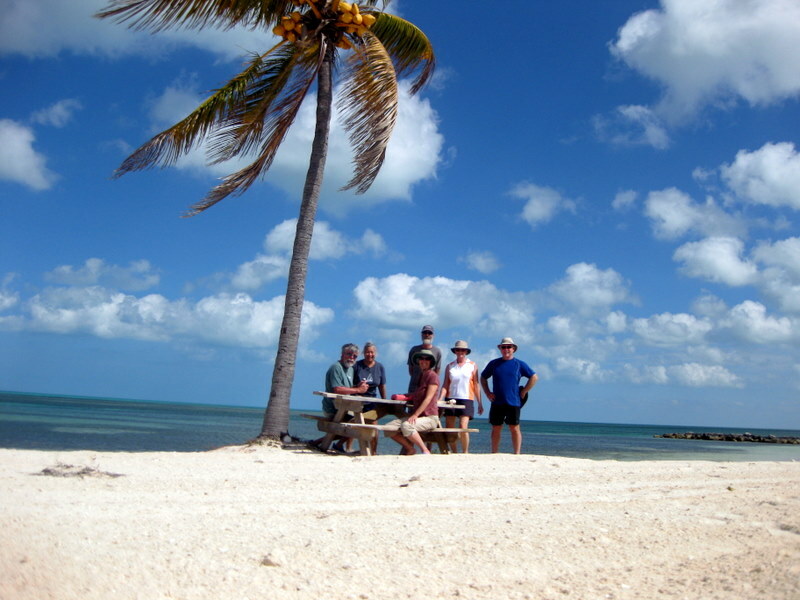 We have loved the company and so much appreciated their laid-back attitude and their affection of the Bahamian Islands. 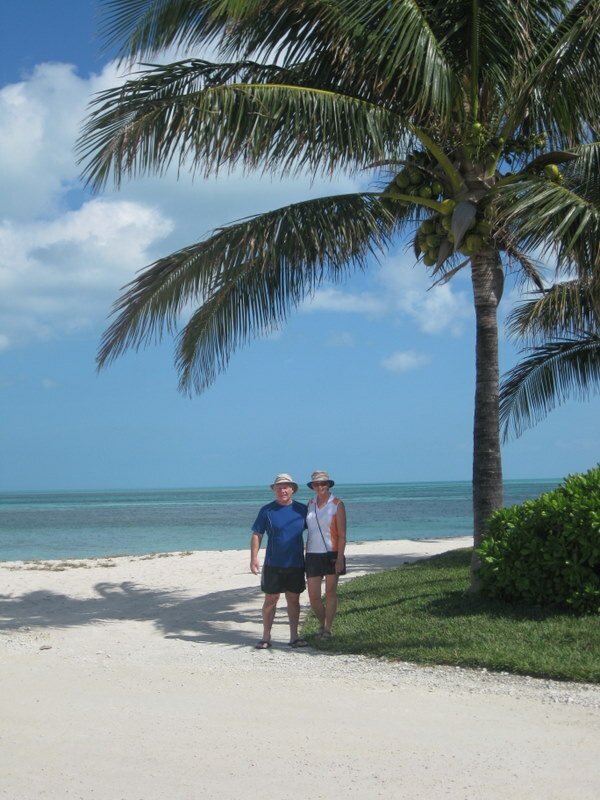 We motor-sailed the 57 miles from Freeport to Great Stirrup Cay in the Berry Islands. We arrived at about 4 pm, anchored and settled in for the evening. Great Stirrup is taken over by Norwegian Cruise lines as their private island. The island is so flat that we could see the cruise ship at anchor on the other side. We could even see the para-sailors across the land. We didn’t feel like exploring so we didn’t even launch the dinghy. 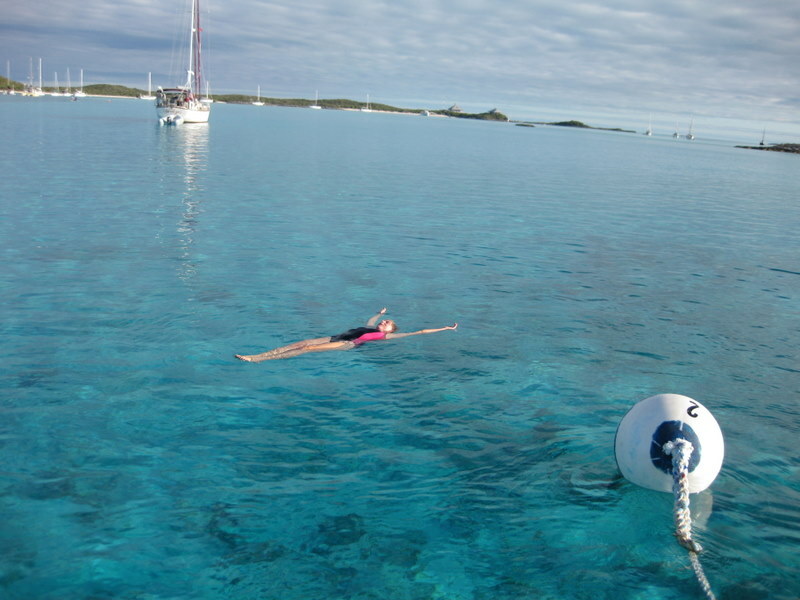 The next day we had a short sail to Hoffman Cay. Pam had read about a “Blue Hole” there so we thought that would make a great visit. Again, we had to motor sail most of the way since the winds were almost on the nose. We launched the dingy, loaded it up with Mary and Axel from Azaya and Pat and Wayne from Kolibrie and set off in search of the blue hole. 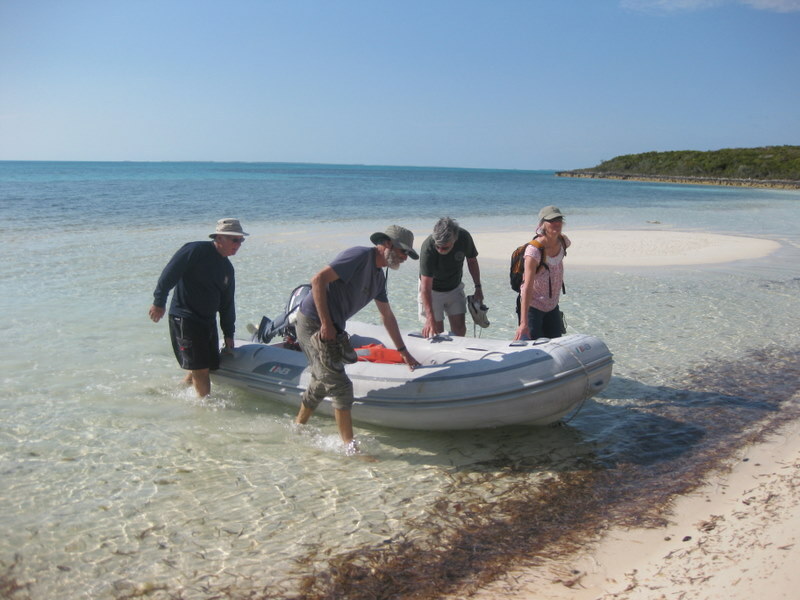 We pulled the dingy up on a beautiful beach and walked the short hike described in the guide book. 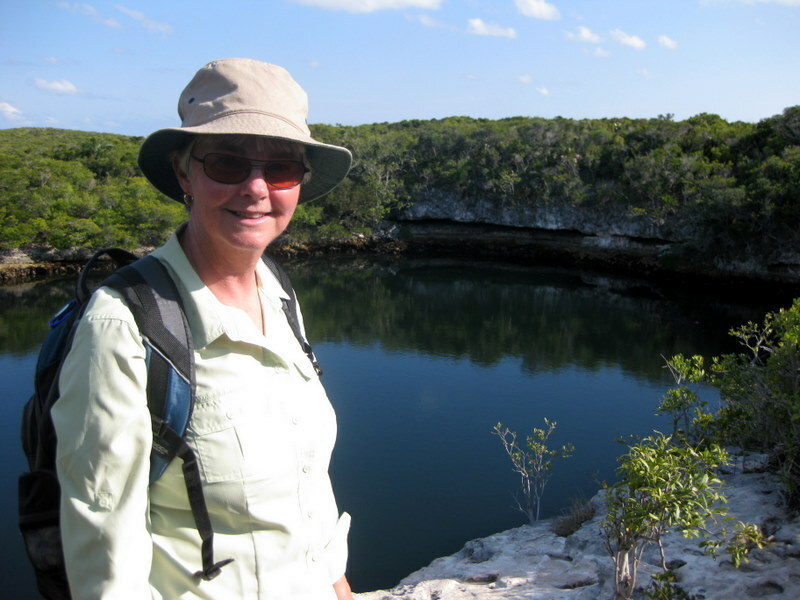 The blue hole was green – but very impressive – just like the cenotes we see in Mexico. We spent a while looking at the rock formations in the cave and watching a fish swim in the green water. Back to the boat where Glen took his first swim off the boat! He has been looking forward to that. 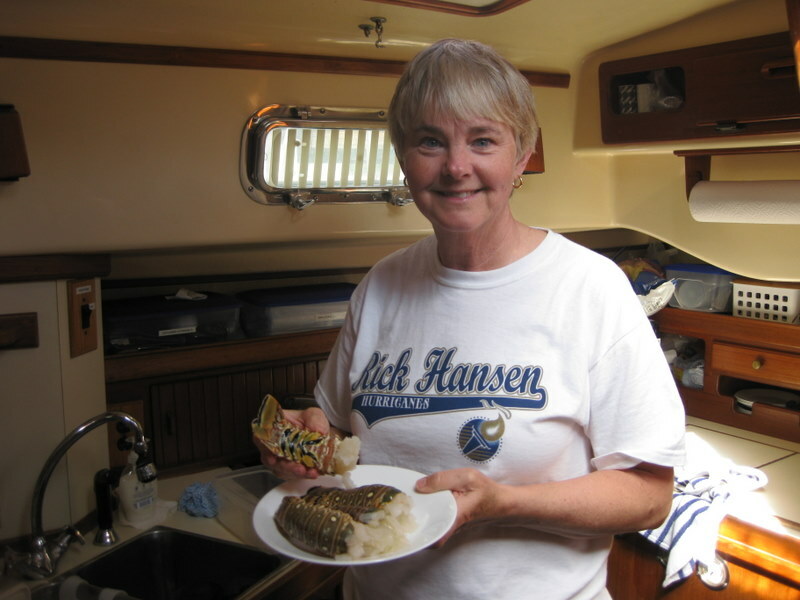 We joined the other 2 boats for dinner and shared Pat’s catch of mackerel and barracuda. The next day we left Hoffman for the 37 mile run into Nassau. The winds were aft of our beam so we had a great broad reach for most of the day. We were hit by a squall 10 miles out of Nassau so we had to significantly reduce sail. 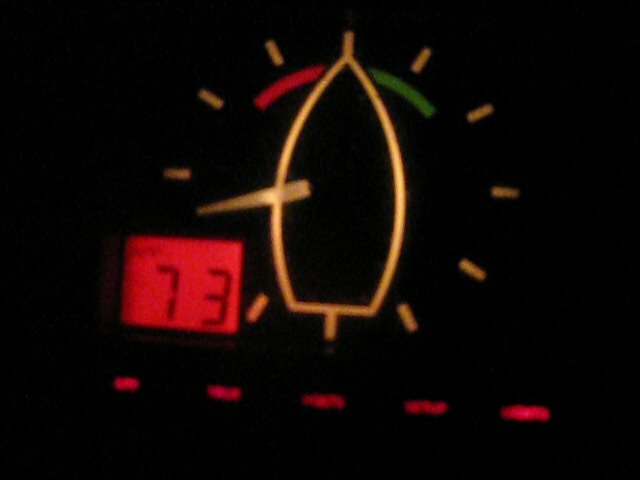 So instead of going 6 to 8 knots we slowed down to 5 to 6. 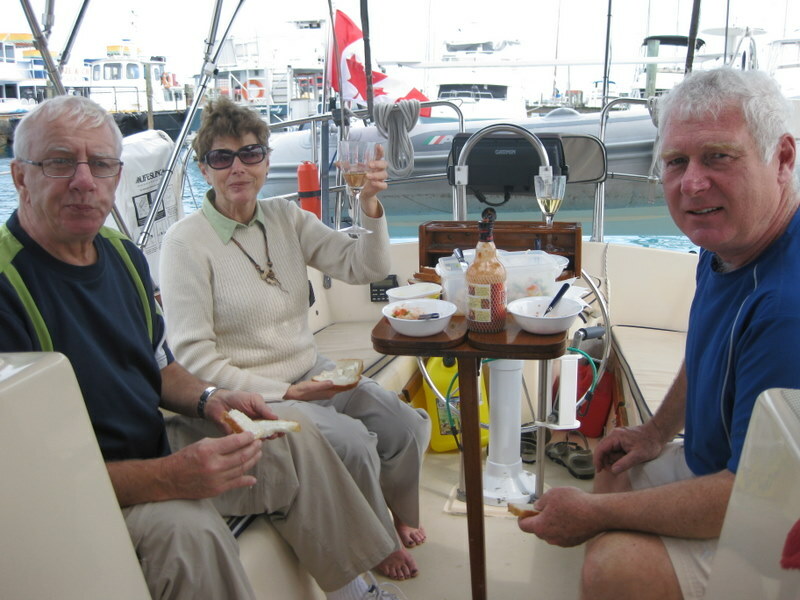 We motored into the Nassau Harbour, looking for an anchorage but opted instead to dock at the Nassau Yacht Haven to make it easy to pick up our first guests – Mike and Charlotte Inman. Westend is a port of entry for the Bahamas. There is a small community here - along with some posh homes built in a planned community with waterfront canals, paved streets, landscaping, street lights. Just like many things Bahamian, hurricanes and the economy have conspired to make it less than successful. John Travolta has a home here - experienced a tragedy with his son - in the news recently. The opening of the casinos in Port Lucaya hit Westend and hotels and tourist attractions here closed. We went for a beautiful beach walk with our "crossing buddies". 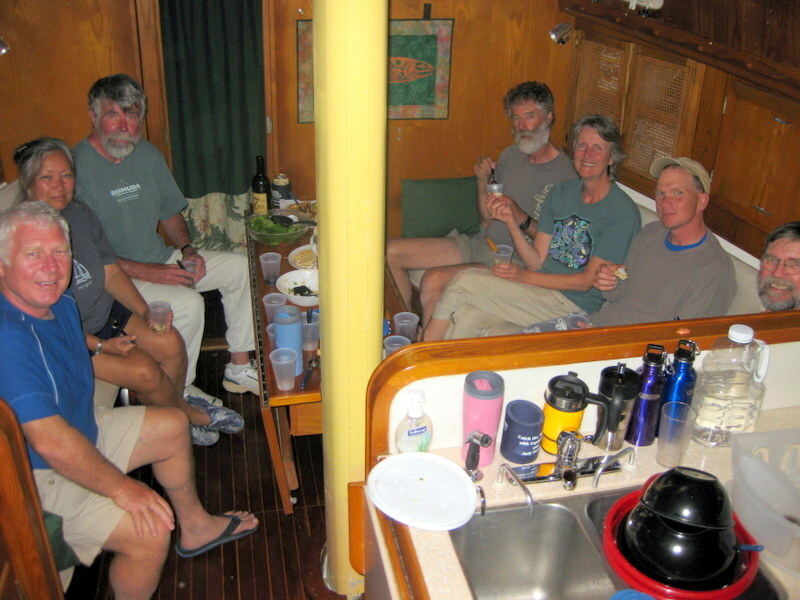 Pat and Wayne from Kolibrie had champagne to celebrate our crossing. Very thoughtful. We went for a long walk into the settlement of Westend, met Jerry, who sold us conch - went to a small grocery and bought limes, onions, and sweet peppers to make conch salad. Walked back to the boat to contemplate salad making... and Bumpy arrived!!! We haven't seen him for many years and it was good to catch up with family news. 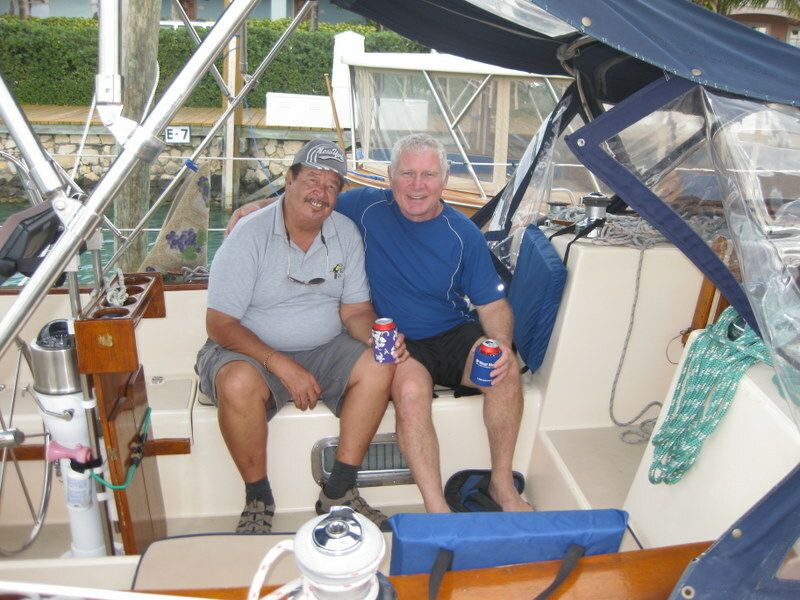 Glen and Bumpy took off for more than one beer and conch salad from a vendor up the road. They came back several hours later with great smiles. Had a community dinner on Azaya. 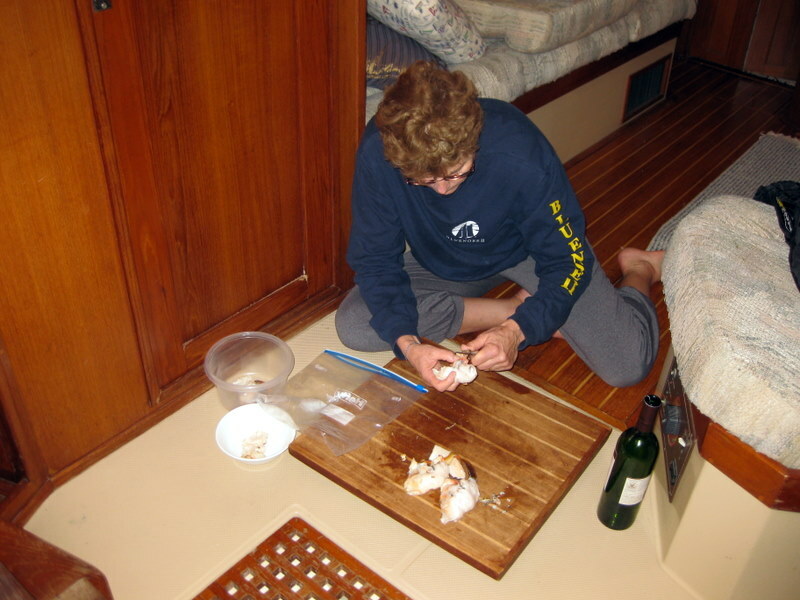 We supplied conch salad, Mary and Axel (Azaya) made cracked conch and Ralph (Equus) cooked the mahi that he had caught on the crossing. Great stories and great company. Jerry arrived the next day to sell us some crawfish - yum... they made a delicious dinner. We spent 3 nights at Westend waiting for a cold front to pass. 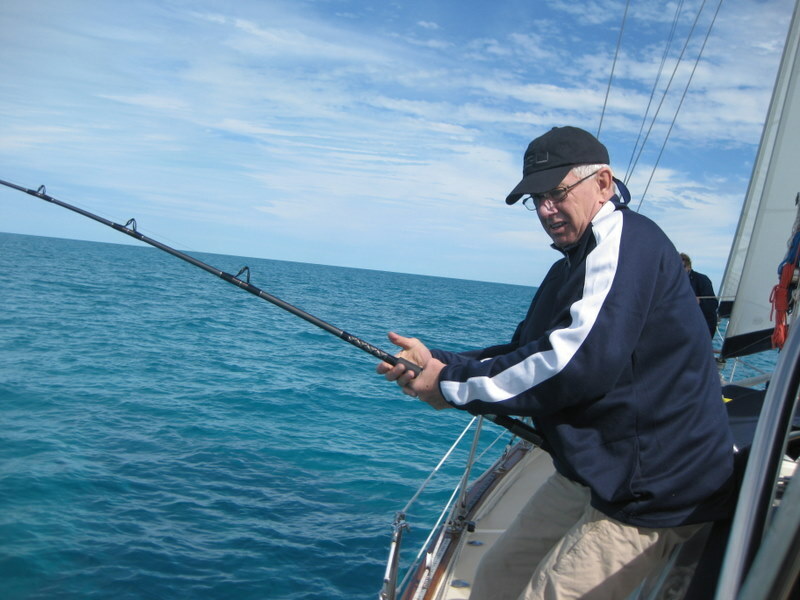 On Thursday, we left Westend and had a great sail to Freeport... dragged a fishing line and had one strike. Something bit the line and took our $12 lure! There were four of us in a row and we took pictures of each other and kept in touch by VHF. We passed the Port of Freeport with its many oil tankers, container ships and cruise ships in dry dock. Our group had considered anchoring in one of the many undeveloped canals but were concerned about the predicted weather. GOOD THING!!! We spent our first day lollygagging around. Bumpy arrived and we took off on a tour... with lots of beer. Visited Bumpy's brother, Solomon, at Palm Securities, Cezario at OBS Marine and drove by Roslyn's office. 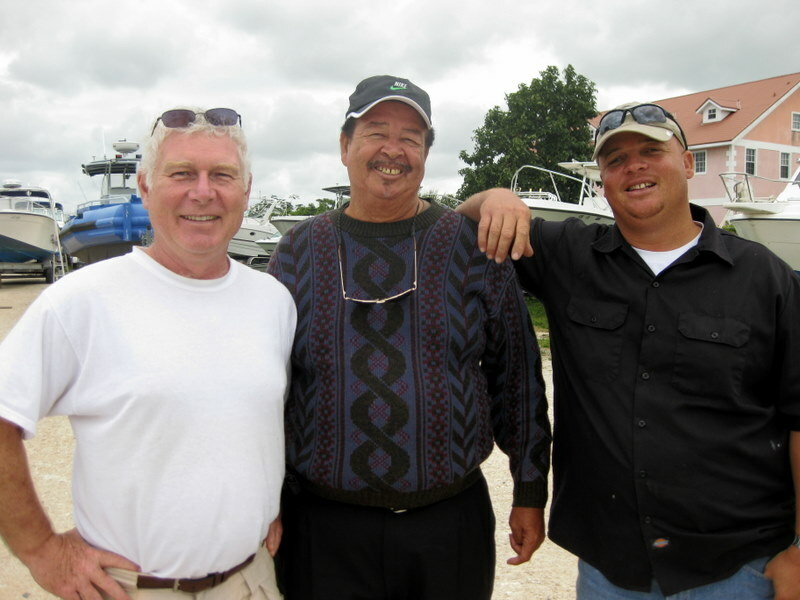 Came back to the boat and enjoyed good conversation with Bumpy and his sons, Cezario and Berlington Junior. Got some great fishing advice. These boys know fishing! Berly Jr predicted that the squalls would hit at 8:00 so they left at 7:30. At 8:00 PM something hit the fan. At the height of the storm, the wind gauge registered 73 mph!!! Wow - hold your hat! Almost hurricane force. The rain was coming horizontally and we couldn't see more than 10 feet away. We had a very stormy night and were glad to be secured to a dock with six lines! Weather was better today but cold. About 16 C. Spent more time with Bumpy and Cezario - nice lunch - and said goodbye. Tomorrow we strike out for the Berry Islands - and then to Nassau to pick up the Inmans. We are looking forward to this next chapter in our adventure!! We had quite a day! After waiting 10 days for the "weather window", we got it. We had been warned not to cross the Gulf Stream if the wind had any northern component in it, so we waited and waited. The forecast for Monday had a slight north but with very light winds so we jumped. We had lunch the day before with two other couples waiting like us so we all planned to get up at 4 a.m. for the Endeavor shuttle launch, check the weather, communicate by radio and leave together. It was cold when we got up but we sat on the deck and watched the shuttle launch. It was amazing! We have seen several launches but sitting on our boat, one hundred miles away watching this one was very special. We could see the orange glow lift off and then saw the boosters separate. We watched the shuttle for a while - it looked like a large moving star. Then we leapt into action. Back and forth on the radio with our buddy boats, coffee made, weather checked, sail cover off and sail readied, things stowed. Anchor up at 5:30 and we drifted in behind Kolibrie from Michigan and Azaya from Alaska. Out the channel, through the Lake Worth Inlet and out into the dark ocean. We raised the main in the dark to help stability. 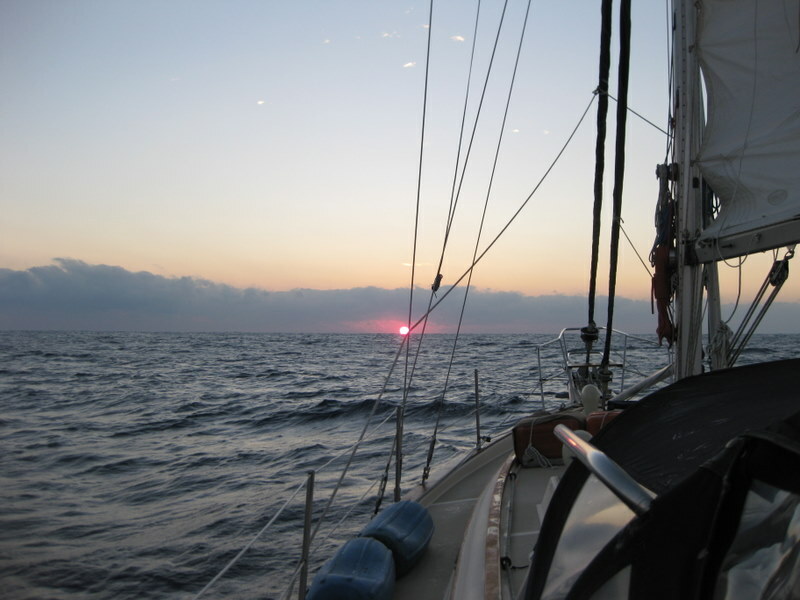 We sailed towards the sun rising to meet us at 6:30. A big beautiful red ball. It was pretty rolly for a while but very little wind. The trip is 54 miles across. The Stream is about 10 miles off the coast of Florida and is 20 or so miles across. We really didn't feel much effect from it. Water temperature went up 3 degrees and the changing colours were incredible but we didn't adjust our course for the current. The rolling lessened (thankfully for Pam’s tummy) about 1/2 way across. Kolibrie and Azaya were within our sights the whole way and we communicated with Equus , from North Carolina by radio - they were about an hour ahead. It was nice to see those other masts out there! Every now and then we would get a call from one of them with a "dolphin alert" or "did you see those flying fish" or from Equus "I just landed a 27 inch mahi". Nice to have friends out there. We dragged a line too but didn't have a bite. Sometimes we were close enough to take photos of each other. Saw a lot of Portuguese Man of War. We tried to get a pic but they are little and we whizzed by them. Occasionally with the right light we could see their long red tentacles below them, hunting for prey. We saw flying fish and watched a dolphin bow riding with Kolibrie. Land ho about 3 pm. 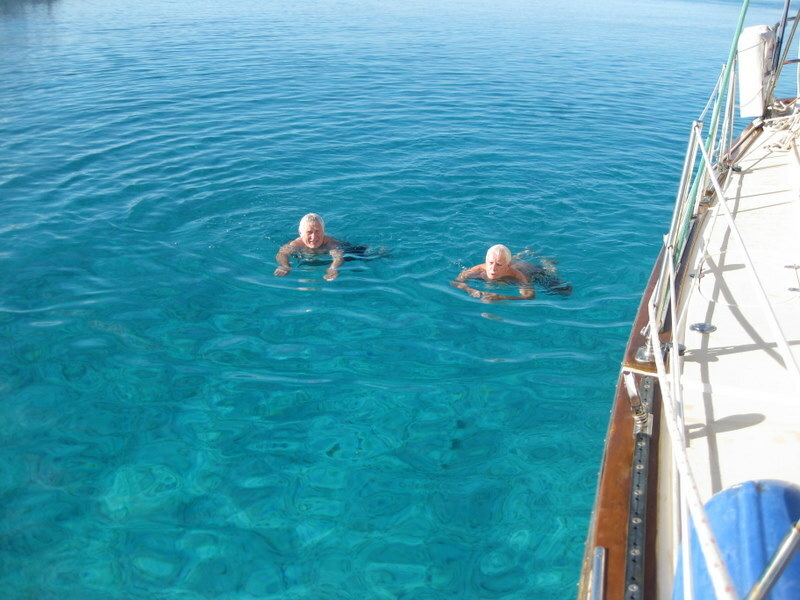 The depth sounder picked up the bottom and the water became that aqua blue colour that we associate with the Bahamas. Thirty feet deep and we could see the bottom. 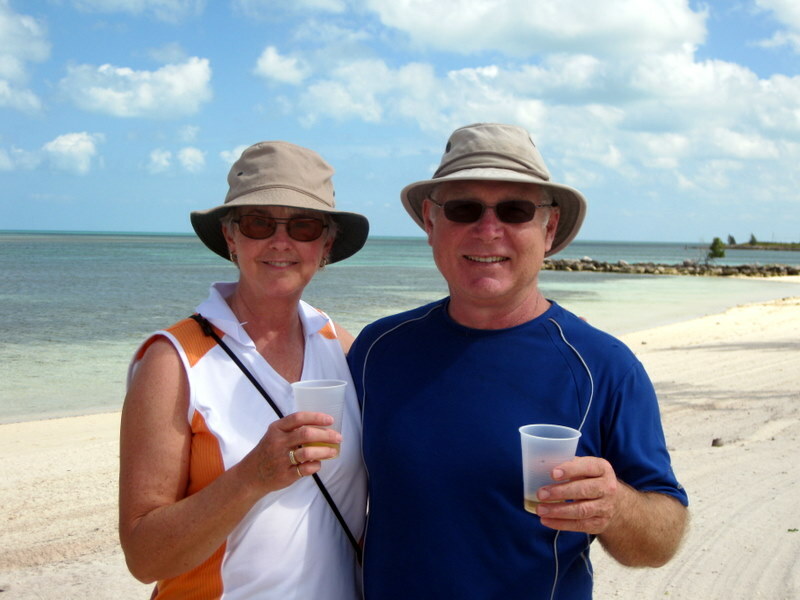 The four of us cruised into West End, a small marina with Customs and Immigration on the tip of Grand Bahama Island. 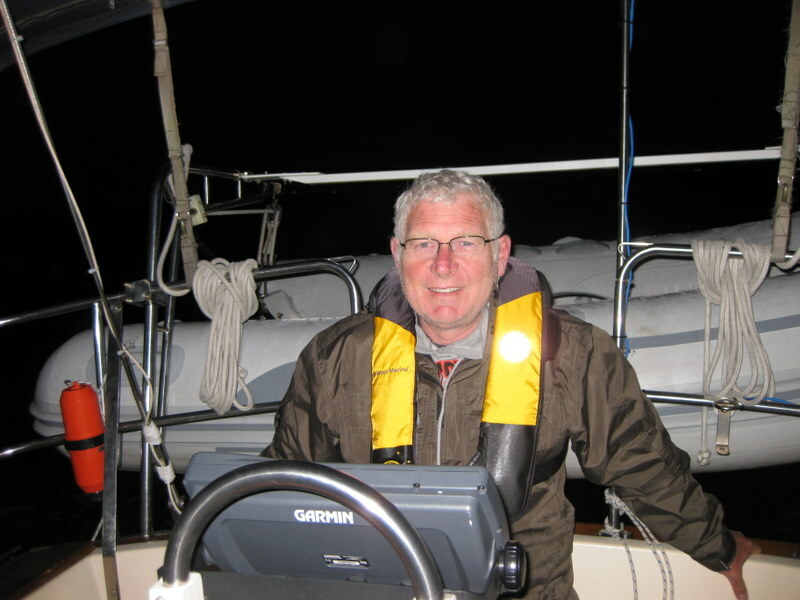 We kept the dockhand busy as we arrived one after the other. High fives and big smiles!! It was cool. Cleared customs, cleaned up a bit and then went to happy hour and a cracked conch dinner at the bar on shore. We relived the entire trip with our new friends and travelling companions. We called our old Bahamian friend, Burlington Saunders and will try and meet up with him after travelling to Lucaya near the town of Freeport, where he lives, about 20 miles away but the weather may not cooperate. We aren't sure. This is a quiet little spot and we hadn't planned to stay here but may have an extra day. No problem, mon, we on island time. Anyway .... we have made and survived "The Crossing" and are ready for the next adventure. 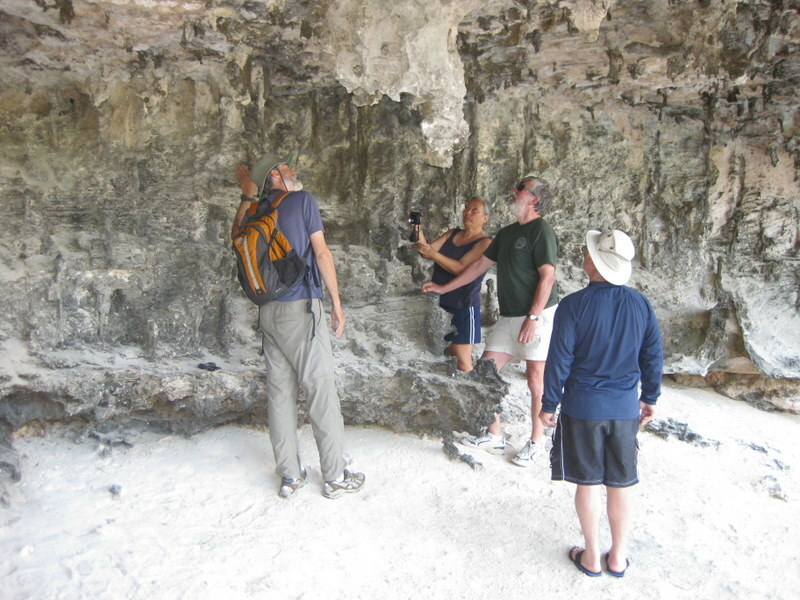 We are about 125 miles from Nassau and want to be there when the Inmans arrive on the 18th. That's the plan. It is 8 pm, we are beat and ready for bed. But we are in the Bahamas!! !